I'm really excited to drink this, so let's (very briefly) cover the packaging and get right into the review! 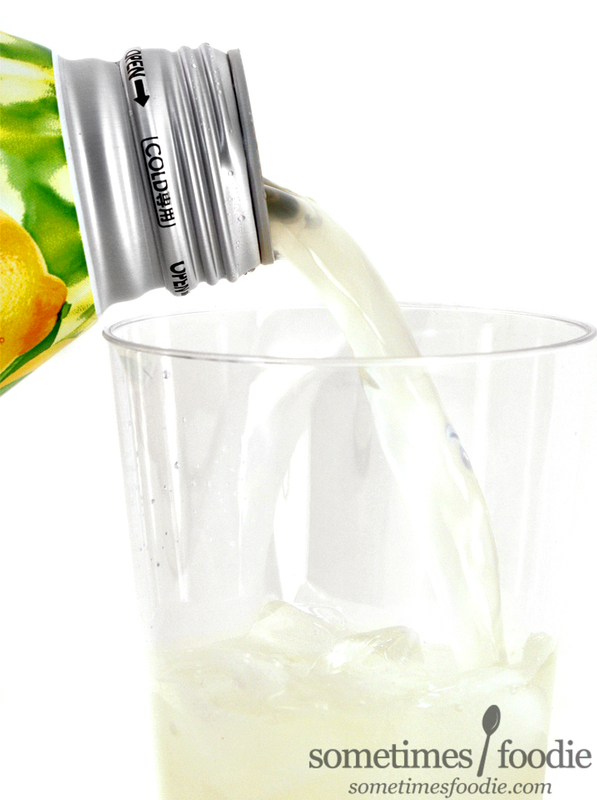 The can is made of thin aluminum with an all-over-print featuring dewy citrus fruit, and it looks really nice. We don't often see aluminum-bottles in the states, they're around, but they're not as common as clear plastic bottles and pop-tab style cans. When I do see aluminum bottles, they looks really...metal-y and cheap, but due to the saturated colors and detailed imagery, this looks very nice for a $2.00 drink. Just look at how nicely it photographed! 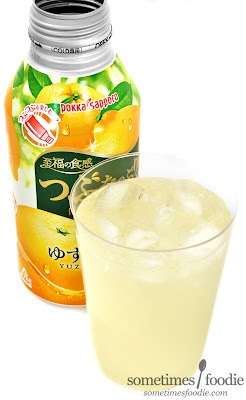 When poured, you could see little pulpy juice-pockets, similar to one of my favorite (poorly named) citrus drinks, Sac Sac, but they are very few and far between. 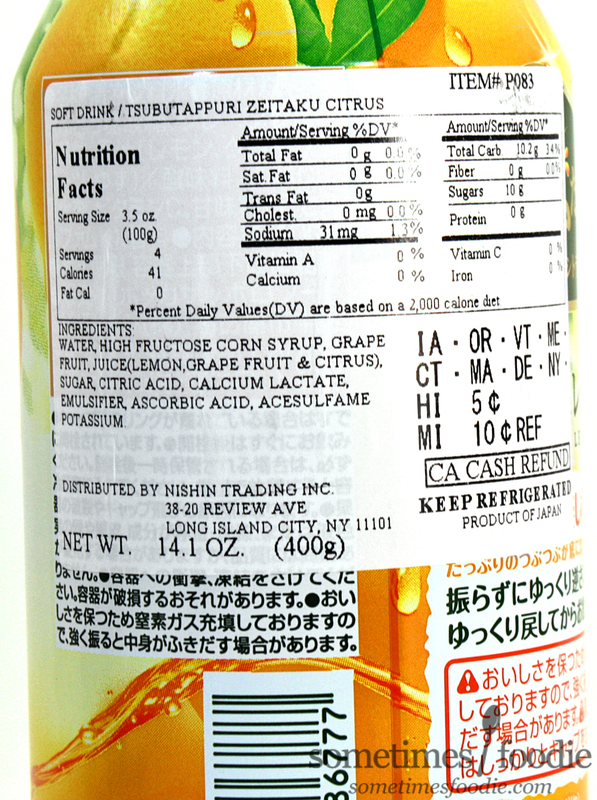 Now, I'm sure we're all familiar with lemon, but what's yuzu? 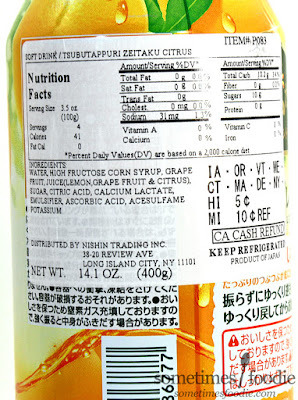 Yuzu is just one of the many lesser-known (in the USA) citrus fruits. Visually, it's like a rounder-lemon that's more tart, like a grapefruit, but with some orange-like notes as well. Bright, tart, slightly bitter and juicy. 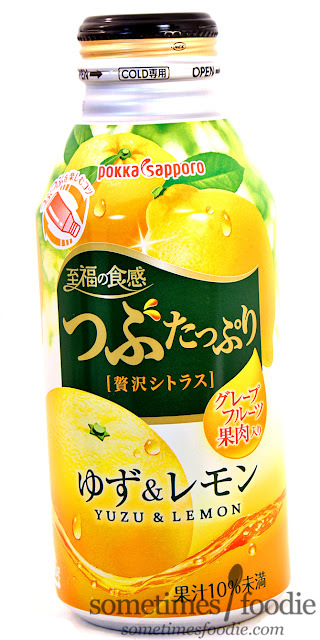 It's quite popular in Japan, although, like Lemons here in the USA, they're not something you'd peel and eat. They're more of a garnish or additive to other dishes. I've had yuzu flavored sweets in the past, and for the most part, I have a hard time telling the different between it and normal lemon sweets. I'm sure there is a distinct different when tasting the real thing, but I think candies take some liberties and glorify a basic citrus candy with something more rare and specialty-sounding, like "yuzu," instead. Surprisingly, with this drink, I do taste more of a difference. I took a sip, and the flavoring was bright, zesty, and complex. It tastes more complex and delicate than a normal glass of lemonade, and I attribute that to the yuzu inclusion. The first few notes are light and sweet, like a lemonade, but then these zesty, almost bitter, grape-fruit like notes develop, along with an almost tangerine-like sweetness. If I hadn't read the can-bottle, I'd think this was some kind of fancy Ecto-Cooler or similar citrus-based mixed-juice drink. It's really refreshing, especially ice cold, and I absolutely love it!